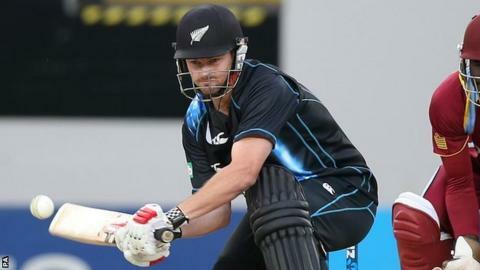 Worcestershire have signed New Zealand batsman Colin Munro as their second overseas player for the T20 Blast. Munro, 27, is scheduled to play in all 12 of Worcestershire's Twenty20 group games between 16 May and 25 July. Pakistan spinner Saeed Ajmal will miss six weeks in July and August when he plays in the Caribbean Premier League. But Worcestershire have also landed Munro's Kiwi team-mate Mitchell McClenaghan as a temporary replacement to cover for Ajmal in all three codes. Left-arm paceman McClenaghan, also 27, who played for Lancashire in last summer's Twenty20, was expected to return to Old Trafford. But he will play three T20 Blast matches for Worcestershire and is also scheduled to play in all eight One-Day Cup games and three County Championship matches before Ajmal returns in the latter part of August to complete the season at New Road. Munro impressed director of cricket Steve Rhodes when he made 47 off 28 balls against Worcestershire in a Twenty20 warm-up match on the county's pre-season tour to Abu Dhabi when New Zealand were preparing for the ICC World T20. "I was immediately impressed with the way he struck the ball against us," said Rhodes. "His strike rate of an equal amount of sixes to fours in T20 cricket shows the way he plays the game. "Both Colin and Mitch played in the ICC World Twenty20 last month and have real match-winning pedigree." Rhodes' side are looking to improve on a record of never having been past the quarter-finals in 11 years of the Twenty20 format in English county cricket.